“Wait, you say, it’s Thursday. WTH? !” Well, it’s simple really. As we mentioned on Tuesday we wanted to do a post on winter pruning, but didn’t have the time to do it justice. So here is Tuesday’s post two days late — or two days better depending on your perspective. First of all let us point out that whole books have been written on the art of tree pruning, and it really is an art. Pruning shapes and trains trees to give them a pleasing, natural shape. 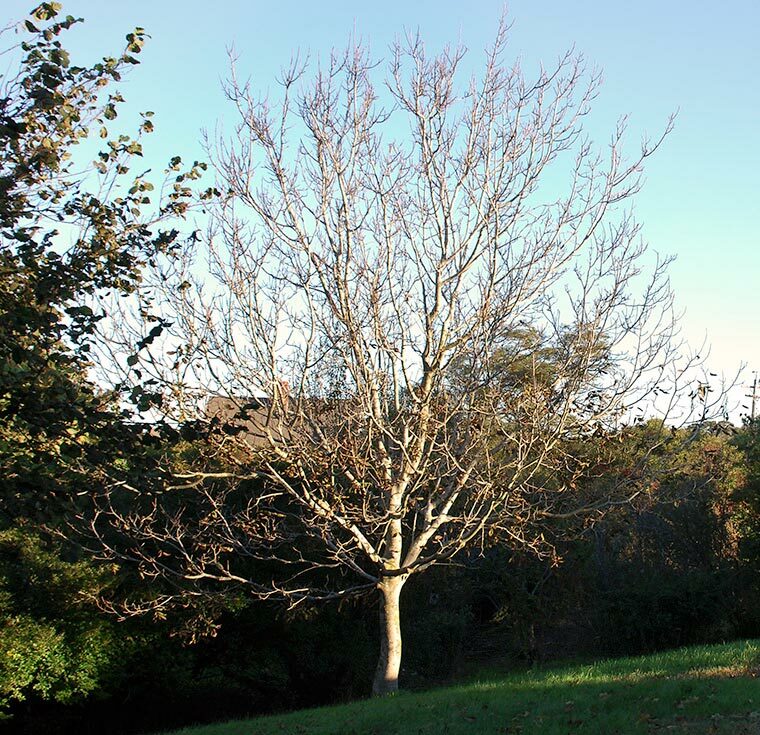 Most tree pruning is done in the winter or very early spring when trees are dormant. It's easier to see what needs to be done after the leaves have fallen. Let’s talk about safety first. You should not be pruning large trees — that’s a job for an arborist. Unless you have great health insurance and can afford to be laid up for a few weeks, you should limit your pruning to what you can reach from the ground. If you must use a ladder (and never to prune heavy branches), don’t go higher than a couple of steps and make sure you have a helper around. Before you start be clear about what you are trying to accomplish. This will save you from going too far and ending up with a sparse, sorry mess. Reasons to prune include: thinning crowding branches to let more light in, removing all crossing, rubbing branches, removing weak or diseased growth, limiting size, and removing suckers and watersprouts. Next are tools. Here we like to keep it simple (and safer) by using hand tools. You should be able to do the job with: a pair of sharp bypass clippers, bypass loppers, a folding pruning saw, and a 12-foot tree pruner. Wait for a day that is above freezing. Cutting frozen wood can damage the cells and the cuts won’t heal properly. Step back to look at your handiwork often so you can see how your cuts are affecting the shape of the tree. First you will be looking for dead, diseased or weak branches. Next take out the crossing branch or rubbing branches. Then remove suckers or watersprouts. These are thin branches that shoot straight up from a lateral branch. They usually exhibit very vigorous growth and take resources from the main tree growth. Once you get all of this done, look at the tree’s shape. You might be finished. Certainly you’ll need to make a very few cuts after this. Here’s a link to a very good, detailed article from the USDA Forest Service that has great illustrations showing how and where to make good cuts. This is a good article on fruit tree pruning from the University of California Cooperative Extension. We’ve tried to give you a good overview on tree pruning, but it’s always a good idea to do a little pre-trimming research on your particular tree as some of them need special care. Happy pruning – and BE CAREFUL! We bought our little house from a lady who was in her 90s. Unsurprisingly, the garden had be let grow wild. We found a wonderful arborist, who we’ll be working with over the next few years, to improve the health of our fruit trees.